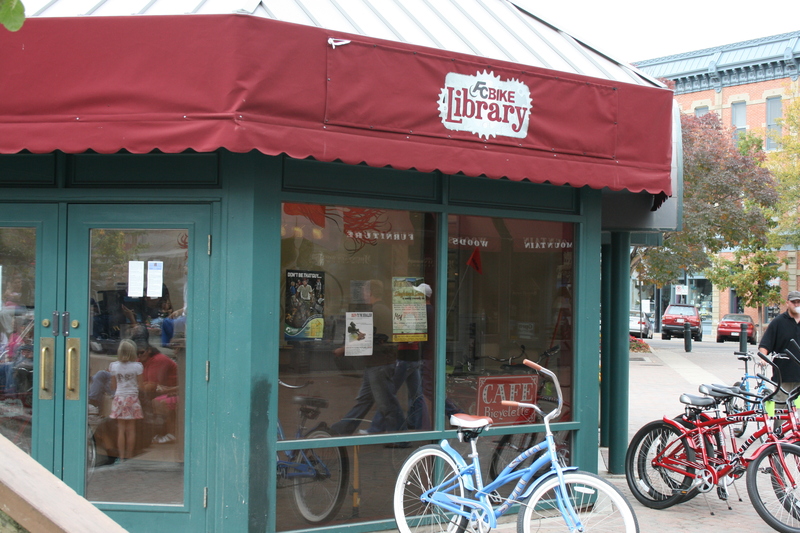 The Provo Bicycle Committee is petitioning UTA and the Provo City Council to include bicycle lanes on the plans to re-do University Avenue. This is a unique opportunity to create a real “Complete Street” for our city, but your help is needed! 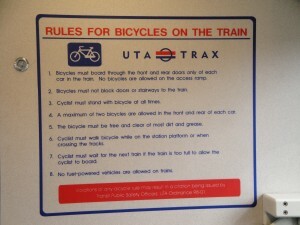 It has come to the attention of the Provo Bicycle Committee, and citizens of Provo, that Utah Transit Authority (UTA) will be installing a BRT route on University Avenue from 700 North to 300 South (connecting to the Provo Intermodal Transit Hub). While this project will be a great asset to many citizens in Provo and a great help in making the FrontRunner train accessible and usable by all citizens in the Provo-Orem area, the current BRT proposal excludes any bicycle use on either street. We believe this to be a serious exclusion of many citizens in the Provo area. Since 1990 there has been a 96% increase in trips by bicycle to work. This statistic does not take into account students going to school, families running errands, or any other transportation-based cyclist. 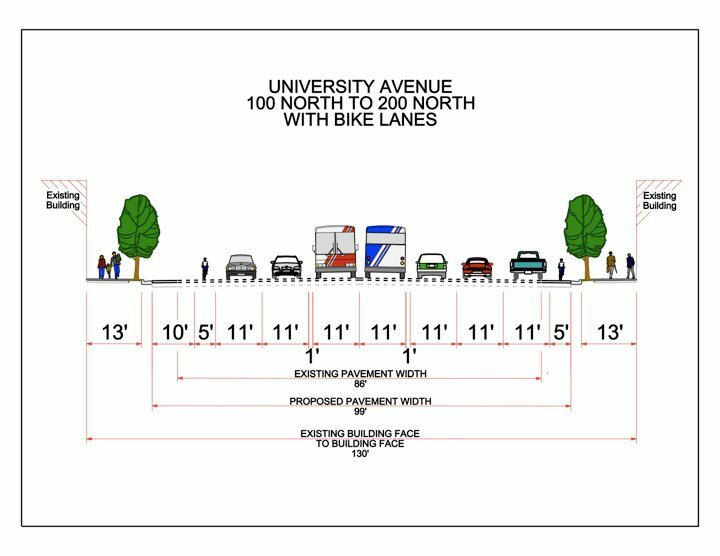 By not including cyclists, UTA and Provo City are promoting incomplete streets and passing up a timely opportunity to have a north to south dedicated bicycle lane along University Avenue. 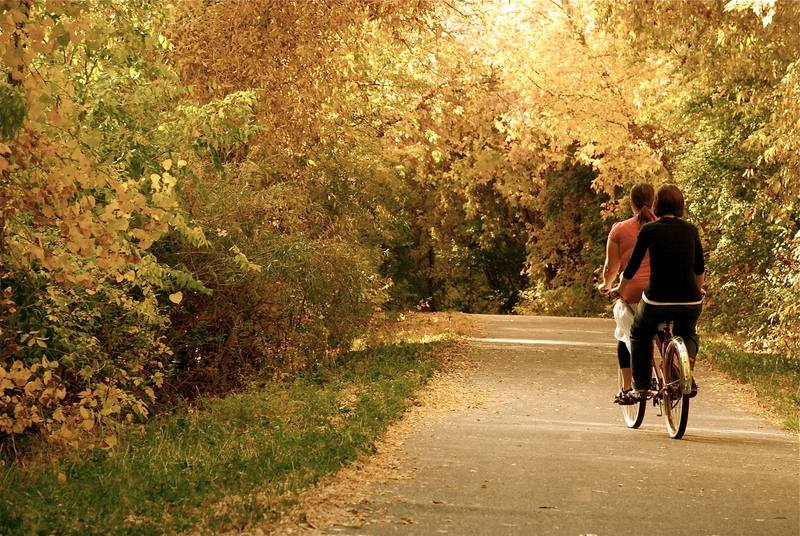 This lane would not only connect Provo and visiting cyclists to the rest of Provo, but it would also connect cyclists traveling north and south to the main bicycle paths leading into Orem and up Provo Canyon. 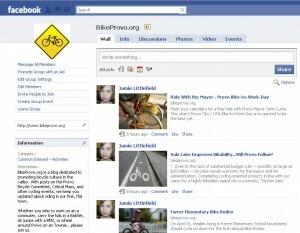 Making this connection is vital for cyclists in the Provo area. If University Avenue is going to be renovated into something better it should be made into something that is the best option: a Complete Street. Complete Streets are streets that take into account mass transit, vehicular traffic, pedestrian traffic, and bicycle traffic. Complete Streets are a backbone of livable communities and treat each form of transportation evenly and fairly. Complete Streets are a vital and important marker for healthy communities. This important accommodation will help relieve congestion on Provo streets, calms street traffic, help improve the air quality in Utah Valley, and improve the overall safety on the street for all users. It makes more economic sense for these accommodations to be made now rather than retrofitting the streets at a later date, a further expense to Provo taxpayers. This BRT project must have dedicated bicycle lanes to make it a complete and valuable asset to the community and citizens of Provo. If you or anyone you know is interested in signing on to this statement, please email Tod (todd.d.robbins AT gmail) with your permission for inclusion on the petition-statement that will be presented to the Provo Municipal Council on May 4. 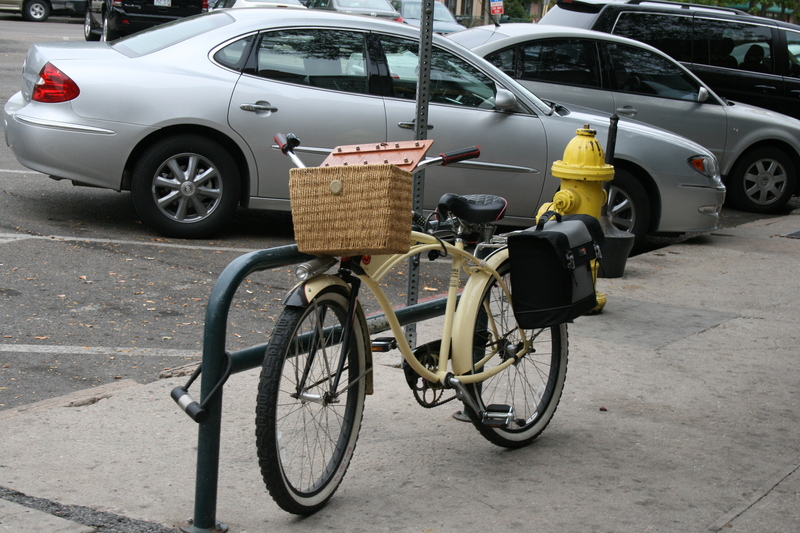 More details on the May 4 meeting will be sent out shortly concerning our plans for influencing the Council in the interest of bicyclists throughout the city and in the interest of Complete Streets policy. We encourage all of you to contact your council member by phone, email, or in person and share your concern for dedicated bicycle lanes along University Avenue. Every message is seriously considered. While I am not a fan of the newer Schwinns (1990’s to present), I really like the idea that this ad is playing on T.V. getting the idea of cycling as transportation to more people. My favorite is the cell phone to puppy transformation. Yesterday was a great end to an amazing weekend power packed with advice, advancement, and general comradery concerning everything to do with bicycles and Utah. There was however one grey cloud over the beginning of the precession. 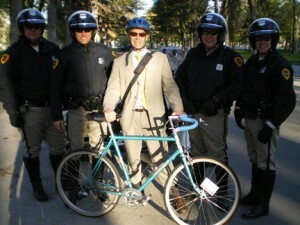 Mayor Becker (of SLC) had his bike stolen yesterday, on the first day of the summit, ironically enough. He had it locked up outside across the street from the summit. 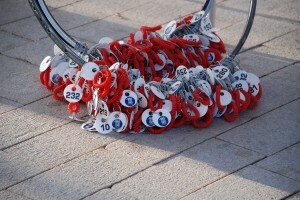 For our readers who have never had a bike stolen I hope that they never have to. For those of us who have had bikes stolen we know what a bummer it can be, and hope that the Mayor can get back on a bike (preferably his) soon. 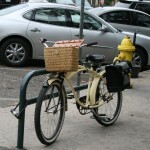 We all know were there is a special place set aside for bicycle thieves. Before we begin I should warn this post is a little long. In my defense the meeting was seven hours long and pretty much packed full of important information I promise that your investment in time will pay off. 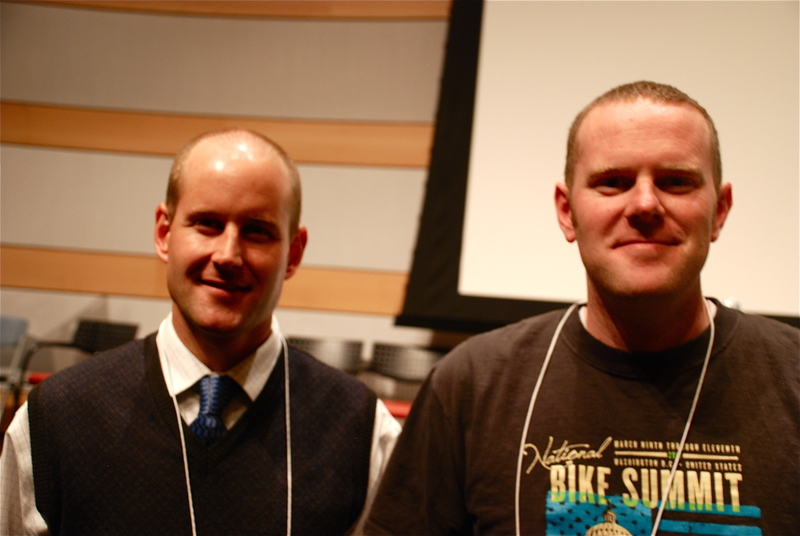 Leaving the bike theft, the rest of the summit delivered just as strong as yesterday with some even more helpful insight into what we can do to make Utah, and specifically Provo, a great place to bicycle. Lets get started. The day started with us finally being able to take part in the awesome bicycle valet parking that was being supplied by the Salt Lake Bicycle Collective. They had offered it the day before but we had arrived to early to take part. It all worked like your standard valet program. They took our bikes put a tag on them and then gave us a bracelet with a matching number. We would end up turning in the bracelet for the bicycle at the end of the day. This is the first time I have been able to take place in bike valet and it was really nice to not have to worry if my bicycle or its components were going to be where I left them when I got out of the meeting. Thanks again to all the Collective volunteers for the help and awesome service. The meeting began with a welcome from Peter Corroon the Salt Lake County Mayor. He had a bit to say about the strides Salt Lake is taking to become more bicycle friendly, which we have covered, or will cover shortly. In closing he pointed out an interesting and somewhat funny story relating the history of bicycles and cars. He stated that in New York 1896 the first car crash happened, it involved a car and a bicyclist. It drew some laughter and thought on the fact that we are still having the same problems in our transportation and urban design as we were over 100 years ago. 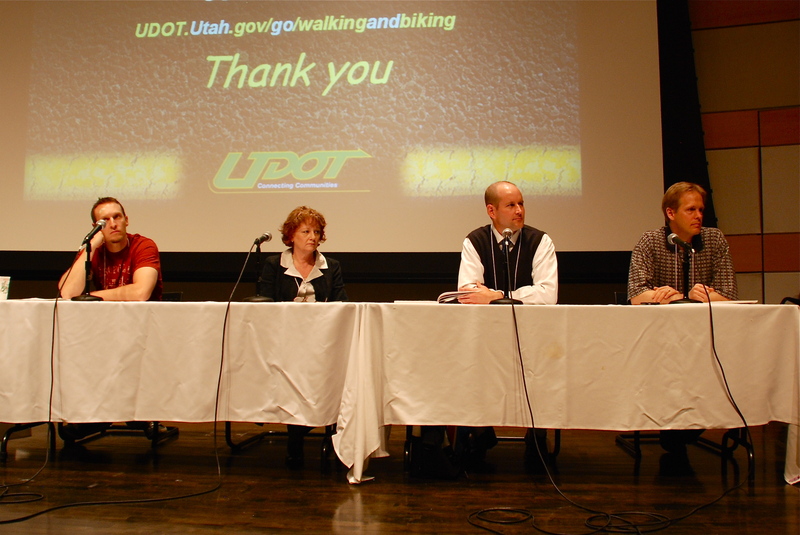 Second was Evelyn Tuddenham Bicycle and Pedestrian Coordinator for UDOT. Mrs Tuddenham spoke of the four fold mission UDOT has for their projects; improve safety, improve mobility, increase capacity, and take care of what we have. She also went into how UDOT does things when planning for roads and paths. All and all she called for cyclists to be informed and if you want to see changes or make sure that new construction has the things that will help cyclists that you need to get in on the planning and conception part of the project, right at the beginning. You will see this comment running through out the speakers and suggestions. 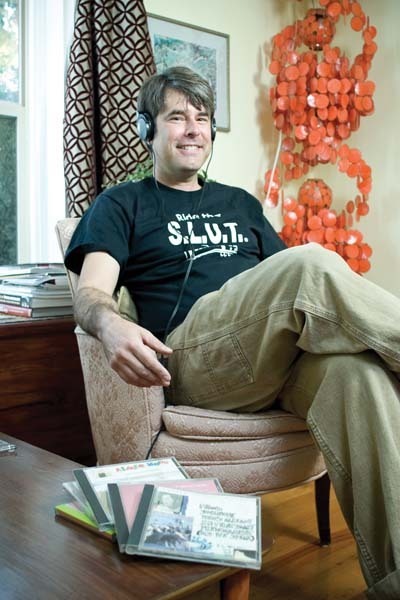 Third was Jerry Jouer (spelling?) who works with the Trails Department if I remember right. The reason for the vagueness is that he was not originally intended as the speaker but stepped in for someone who was to ill to attend. 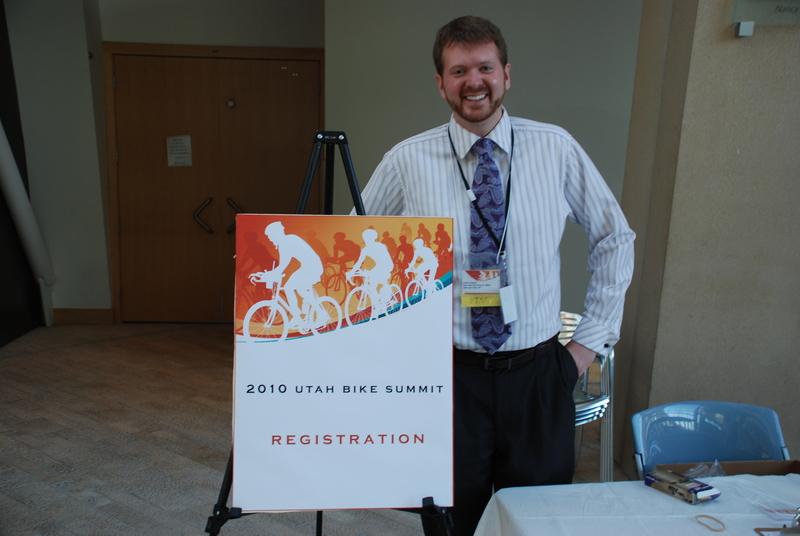 Primarily he spoke on how, out of all the cities, Salt Lake is the most progressive and aggressive with their bicycle infrastructure. Personally I saw this as a challenge for other cities (I am looking at you Provo), to step it up and give SLC a run for their money. Jerry did a great job for having such a limited time to prepare. Yesterday marked the first day of the first annual Utah Bicycle Summit. There is a lot to go over so lets jump right in. We showed up early got signed in and helped a bit with set up. Once things got started we all sat down to hear a welcome from the Mayor of Salt Lake City, Ralph Becker who we know to be very bicycle friendly. Mayor Becker kicked things off with some thank you’s and some awesome statistics. 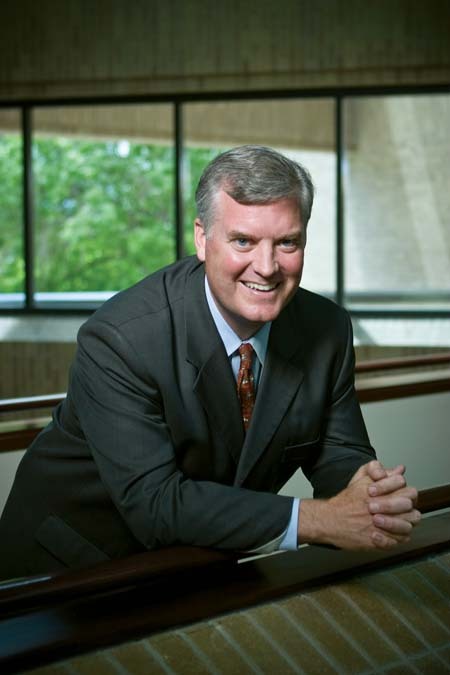 Since his time as Mayor he has increased bicycle spending by 10 fold, implemented 38 miles of bicycle trails just last year, and is shooting for that same growth this coming year. He said that Salt Lake now has two full time people looking at places for bike lanes, and evaluating bikeability in the city. 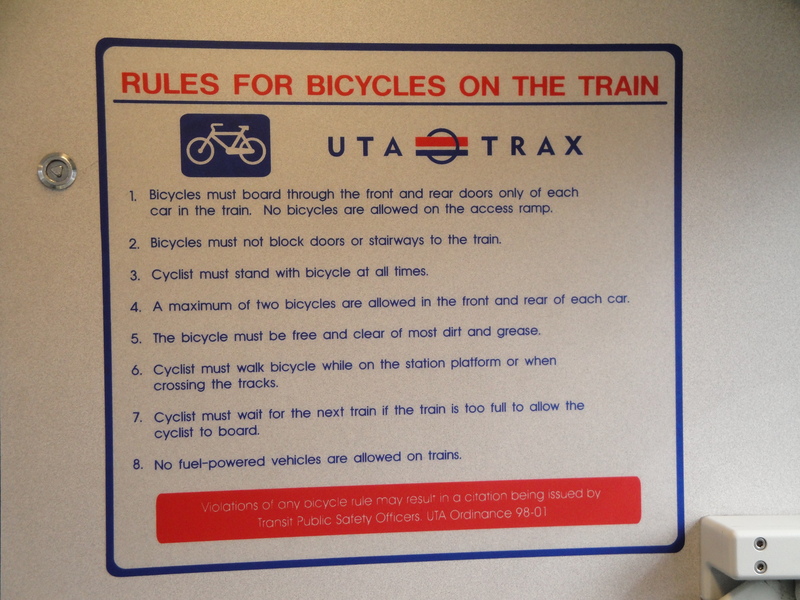 He said that bicycles are “…critical and integral part of our transportation plans…”. His reasons for this were pretty clear bicycles help with three major concerns for any city” air quality, congestion, and individual health…”, as well as bicycles being an “integral part to having high quality communities.” He then went on to say that Utah especially Salt Lake area and Utah Valley are relatively flat and calm weather areas that could see a lot more growth. He then challenged us all to ride more by stating that Minneapolis, which has notoriously nasty winters, has a higher rider percentage that Utah does. His closing comments said that there are people who are worried about the spending that it is going on so it is our duty as riders and advocates to make our voice heard and to be able to back that voice up with action and information. All and all he had a lot of great things to say mainly focusing around Salt Lake however, Salt Lake is kind of a big brother to Provo. 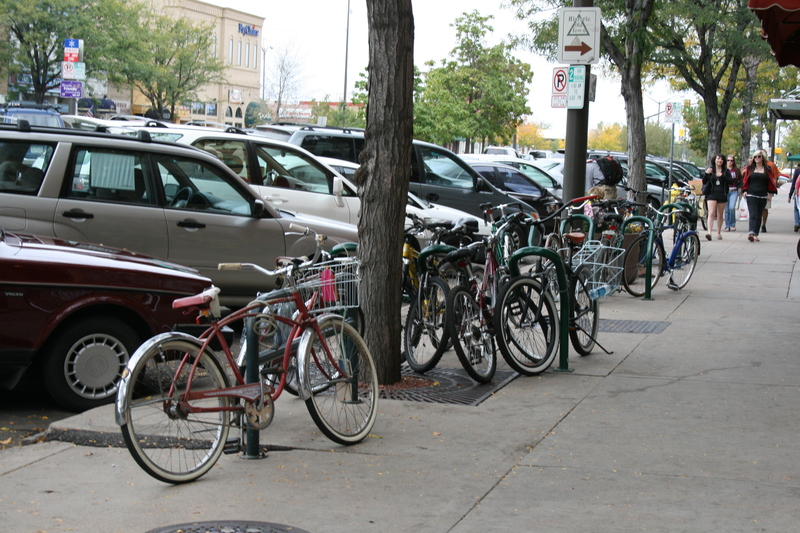 What we can all take away is that there is a lot of movement happening for bicycles in Utah and if Provo wants to take part in that in only takes our interaction and interest to make things happen. Which we will get to a little later. Next up was Council Member Luke Garrott. He is the one that is responsible for the summit taking form and becoming a reality. He encouraged all of us cyclists to find a strong voice and to put in to action anything that we may find useful for th m the summit. Short on time he exited stage left and on came Jeff Miller. 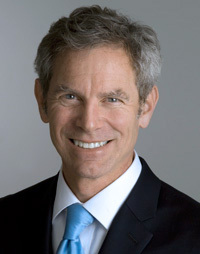 Jeff Miller is President and CEO of Alliance for Bicycling and Walking (this is a link worth checking out). 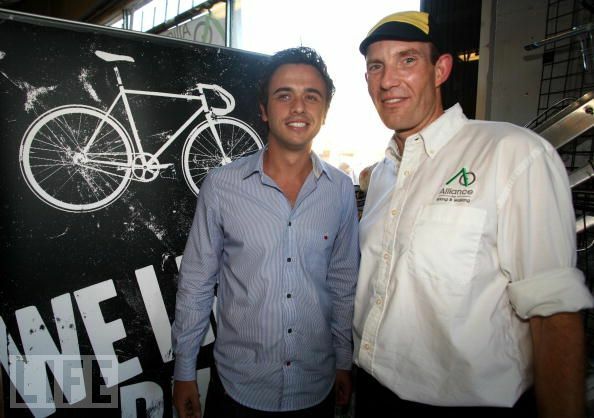 He said most of his experience prior to the Alliance was organizing cyclists and cycling advocates in Maine. He does have some roots in Utah however, one of his ancestors actually put up the first hospital in Provo. Jeff was an awesome speaker. Full of information, inspiration, and a good measure of humor. 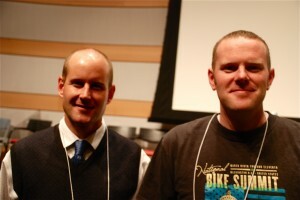 He made a lot of statistical points about cycling in Utah. 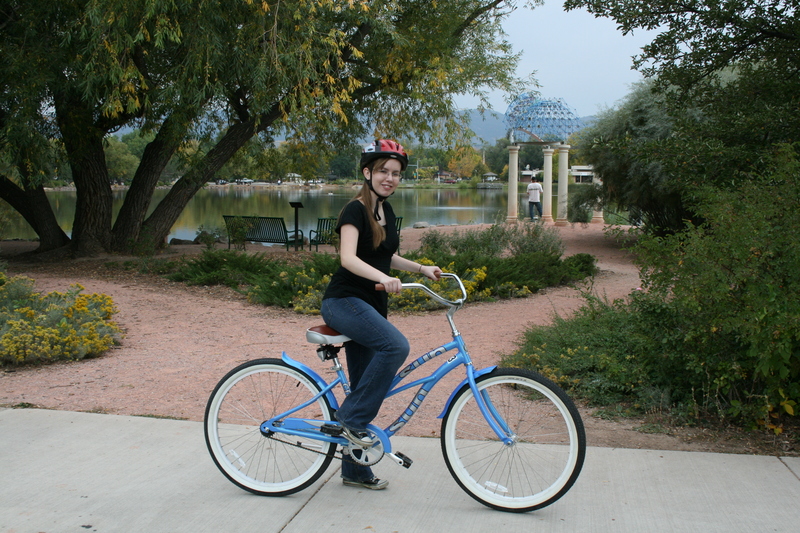 Such as, 10% of all trips to work in Utah are made by bike or foot, for cycling this is a 96% increase over the last 20 years. He also shared with us a despairing statistic, 16% of all pedestrian fatalities occur with minors 16 and under, this is the highest in the nation. There was a ton more and I have the book on it so if any one wants all the interesting information on cycling from around the U.S. you can contact me and I will let you borrow it. Next he gave Utah some suggestions. I am going to bullet point the ones that caught my eye the most. 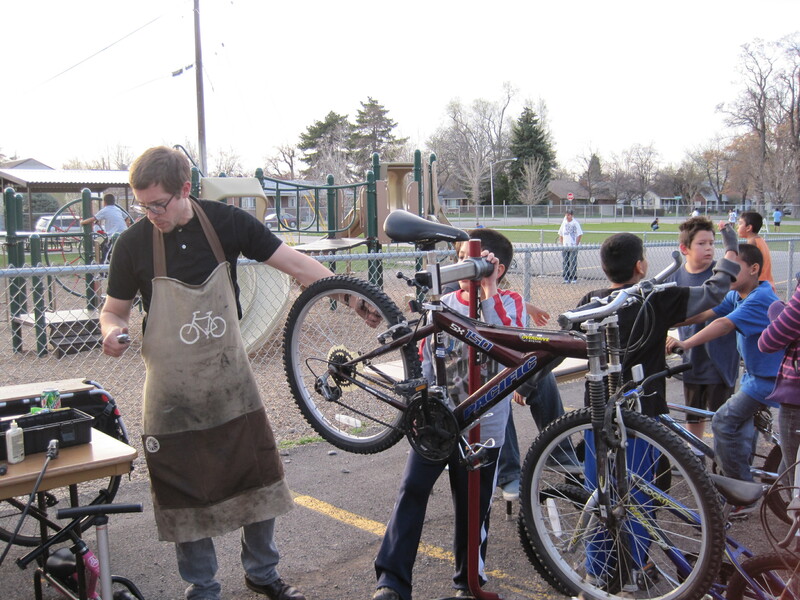 Yesterday the Provo Bicycle Committee had a rip roarin’ good time volunteering at the Farrer Elementary Bike Rodeo. 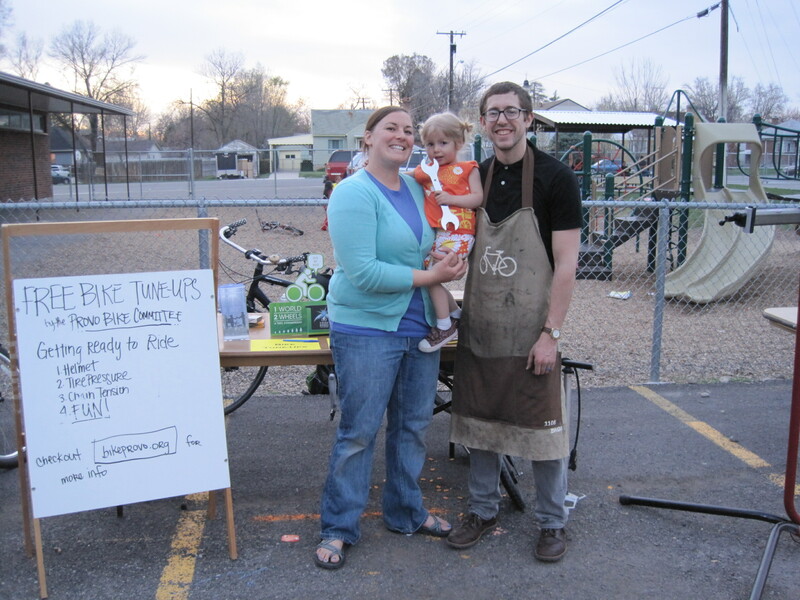 Families came from all over the neighborhood to register their bikes, learn about sharing the road, and ride like mad. 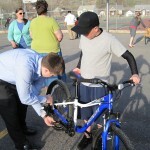 $500 worth of helmets, donated from the Utah County Health Department, were given to kids that needed them. 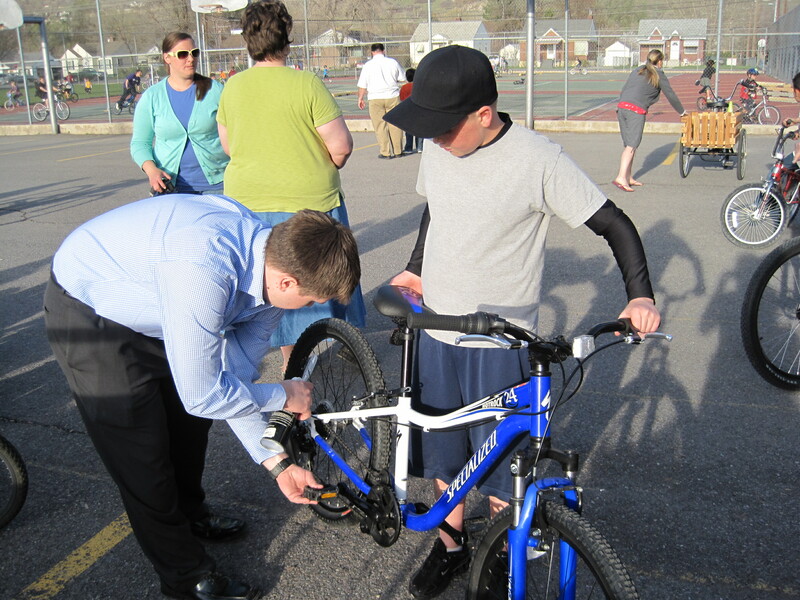 Committee members Zac and Krista Whitmore provided hours of free professional tune-ups and basic repairs to kids riding broken or dangerous bikes. Dozens of bikes arrived at the rodeo with serious problems. 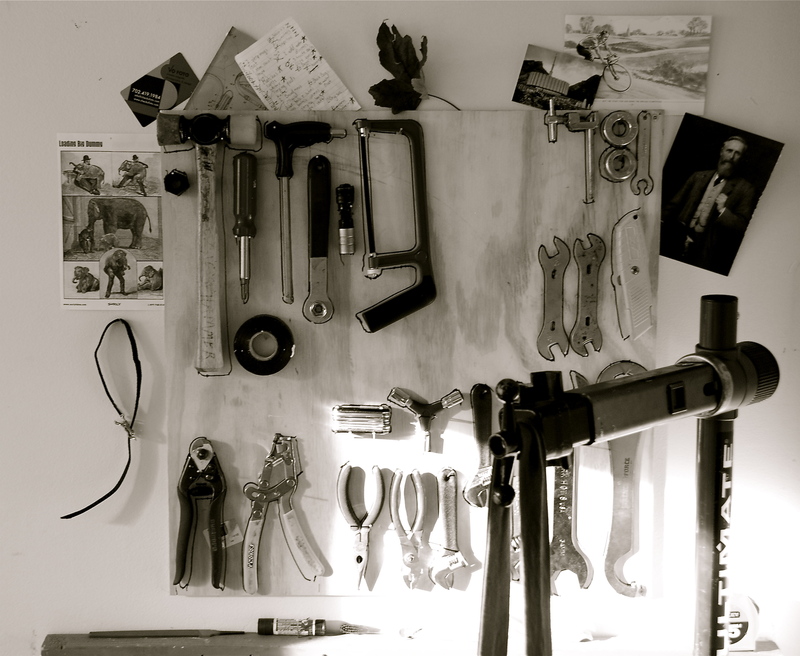 Fortunately, our repair team biked in a stand and tons of tools. 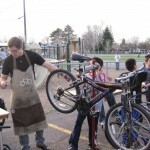 They did a truly amazing job of helping neighborhood kids get their bikes in working order for the spring. 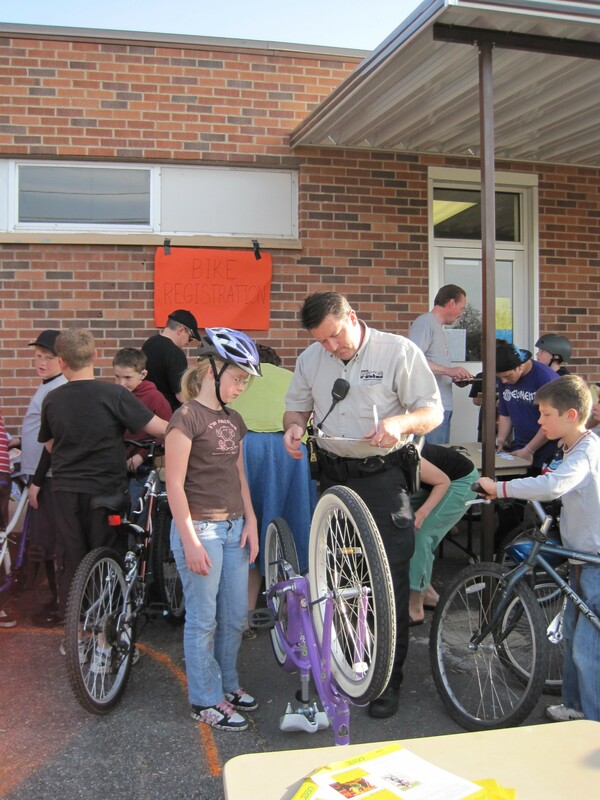 Officer Hunter helped families register their bicycles at no cost, making it easier for bikes to be recovered if they are stolen or lost. Two BYU basketball stars showed up to greet the kids and sign their helmets. The kids were so excited and are already treasuring those celebrity-signed helmets. I wish I caught their names because they certainly should get some credit! 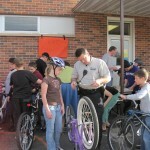 Most importantly, the kids had a wonderful time riding and learning about bicycles. Spring has Sprung, time to ride!! So this week has been a little crazy and really beautiful. 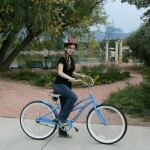 Spring is here and we are getting more and more bike freindly days as a result. 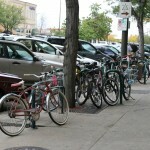 As we all go to grab our bikes some that have sat all winter, and some that have been ridden through the winter there are a few tips in making sure that the first fare weather ride goes awesome. If you are getting your bike out for the first time in months make sure to check the psi in the tires before you do anything. You would be amazed at what a diffrence this little thing will make in your riding. You can find the rating for the psi on the side wall of the tire it will give you a max and a min. I like to run my skinny tired bikes (road bike, track bike, touring bike), at almost full psi and my fat tired bikes (mountain bike, beach cruiser), 5-7 psi below the recommended max. Once you have the tires pumped up grab a rag and make that bike shine like it was new. There is something really satisying about cleaning a dirty bike, and it gives you a sense of accomplishment which makes you want to ride more. Every time you look at the bike you remeber the work you put in to getting it looking so spiffy which makes you wnat to take it for a cruise and show it off. Anyone can wipe something off, you need to get in the nooks and cranys this should be a labor of love. When you are cleaning up the bike Windex and a rag work best for cleaning muck and dirt off. For the grease and the grime WD-40 works great but comes with one warning. DO NOT USE WD-40 AS A CHAIN LUBE, it will dry your chain out and attract a lot of stuff off the road basically ruining your drive train. To lube the chain go to a bike shop and buy actual chain lube, I prefer White Lightning, or Demonds. Now that you have chain lube you need to suspend the bike some how so you can pedal without it going anywhere. You can flip it over or come up with some ingenious way to hang the rear end up. Take a rag and run your chain through the rag. You only have to cycle threw a few times unless the chain is really bad, in which case it may take more than one rag to clean it well. Once you have all the initial gunk off of the chain take your chain lube and place the tip of it on the chain. Now pedal slowly with the tip of the bottle on the chain this will make the lube drop on to each link individualy saving lube ,and putting it in the only place it really matters. Once you have pedaled through a few times with the lube on the chain grab a clean rag, or use a clean spot on your old rag, and run the chain through the rag again. Now your chain is lubed and will not be collecting a bunch of garbage from the road. Now that you have your tires pumped up, biked cleaned, and chain lubed get out and ride your bike. 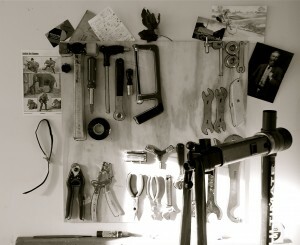 If your bike needs a little more love to get going this season follow the shop links on the side bar, or for you DIY’ers you can go to sheldonbrown.com and follow some of his in depth tutorials. Make it a good day. We’re now on Facebook. 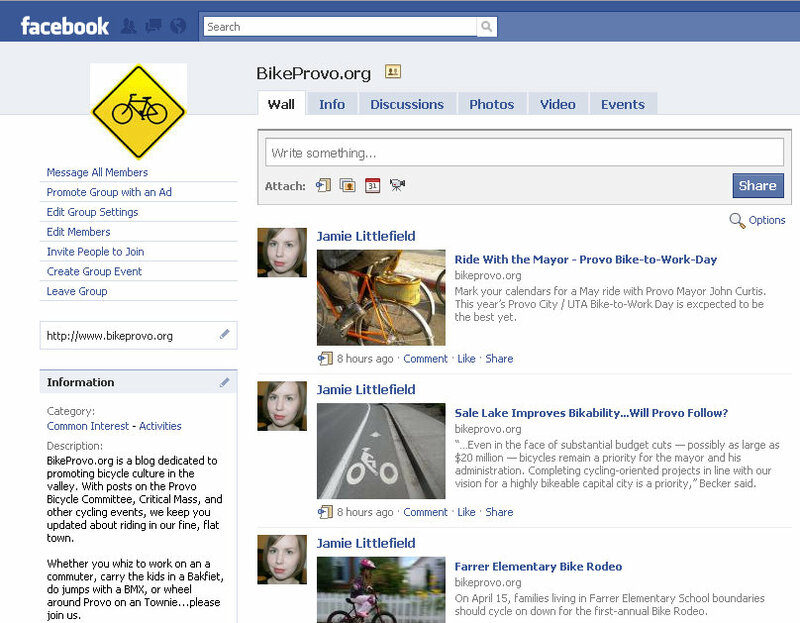 Join the BikeProvo.org Group to stay updated about local cycling events, share your ideas, and invite your friends to join.